Websites for sign shops and large format printing companies. Websites for Sign shops and Large format printers. If you run a sign shop then, like most businesses, you’ve probably realized that you need to invest in an online presence. Your customer base is almost overwhelmingly online already and they want to be able to use a search engine to find local sign shops for all of their signage needs. So, what do you need from a website? You need an attractive design, which sets out your services, showcases a gallery of your work, details your prices and provides your contact details so that potential customers can pick up the phone or send you an email, to start the ball rolling, right? Certainly, yes, you need all that. What about eCommerce, though? Or does that sound too crazy? How on earth can a sign shop make use of an eCommerce website? Surely this is one industry that has to rely on good old-fashioned personal contact! You can’t automate the signage business, can you? Well, OK, everything has its limits, within reason. If you’re sending an installation team 30 feet up the side of a building to fit a custom-made illuminated sign, then you probably don’t want to leave the specification entirely to the customer. Wherever there’s a safety issue, you want to make a site visit, assess any risks and take control of important aspects of the design process to make sure that what the customer wants is feasible and, of course, legal. 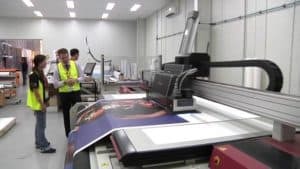 Signs and large format printing account for over $250M of eCommerce sales per year. Leaving aside major external installations though, if you think about your day to day orders, you’ll probably realize that there’s a lot that could be done faster and more efficiently if there was a way for the customer to make their selection online and leave an order with you. If a hotel wants a free-standing sign pointing guests to the dining room, that shouldn’t need a face to face meeting. Wouldn’t it be nice if there was a way for a hotel manager to go online, use a specially created design package to specify exactly what they need, choose their fonts, even upload the hotel logo or other images, add the desired text and place an order for the sign that they need, even if it’s 3am and they happen to be looking for things to do while they’re covering the night shift? Well, guess what? Our online platform can let your customer do just that. Web2ink.com has created a fully automated eCommerce design and ordering system especially for sign shops. Our web to print package includes a feature rich, easy to use design tool, which your customers can use to get their sign just the way they want it before they order. They can choose from your library of fonts and artwork, upload their own images and try out different layouts and size options, saving you the time that you might otherwise have spent working your way through their requirements with them and saving them the time that it would have taken them to explain those requirements to you. As an added bonus, they’ll probably have so much fun using the design software that they’ll want to come back for more! The web2ink.com platform is the result of a collaboration between a print industry veteran and an experienced web designer, used to working at the cutting edge of online technology. It’s taken years of development and expertise to create a package which finally creates websites for sign companies including all the benefits of eCommerce. And that’s not all. This web to print package provides you with a fully integrated order management system. Once your customer has completed their design and placed the order, you will have quick access to all the information relating to the order. You can automate processes such as proofing, planning a work schedule, shipping etc. Our system will be tailored to the needs of your business, so you decide how you want your processes to be organized and you decide which features are important to you. If you’re interested in learning more about how a web2ink eCommerce website can take your business to new heights, then we’d love to hear from you to discuss any concerns that you might have. Once you’re ready to take the plunge, all you’ll need to do is to fill out our online form, with details about your business and your particular needs and feature preferences. We’ll probably need several discussions before we have all the information that we require, because we want to be sure we understand your business inside and out. Only then will we start to build your perfect web to print eCommerce site. Your system will be tailored to your needs, so it will have the features that you’ve told us you will use and we won’t waste your time and page space with the elements that are no use to you. When we’re ready to start building your website, it will probably take around a week to fully create. After that, comes the testing. We’ll go over all the features of your site with you and make sure that you’re happy and confident about using it. We’ll run some test orders, so that you can try out the process and we can make sure everything works as it should. Only when we’re happy and you’re delighted with the site will we take it live and you can let your customers get their hands on it, finally. If there are any problems, at this stage, although we don’t expect there will be, there is a 30-day money back guarantee, so you are fully protected in the unlikely event that the website doesn’t meet your expectations. Each of our website hosting plans includes high-speed, scalable hosting and lifetime customer support, so you know that you can always call on us if you need our help with a maintenance issue. Once the website is up and running, of course, that’s far from the end of the story. You’ll have a great site but you still need to direct people to it. You can either take complete charge of tasks such as adding fresh content, link building and search engine optimization (SEO) for your site, or consider using our marketing services and letting us handle that side of things for you. Either way, you need to get to grips with marketing your website. If you don’t promote it, all the design excellence in the world won’t help you because your site won’t be found. If you want to take responsibility for your SEO, then you’ll have the freedom to make whatever changes to the site you want to. You can integrate third party tools to guide your efforts and monitor your success – something a lot of other website packages won’t provide, and you’ll have complete control over your meta data and page titles, so you can adjust these if you want to try out different key words and title tags to see how your site fares with the search engines. You’ll also be able to add new pages, whenever you want to, so that you can add new content regularly – a vital part of web marketing, since search engines look for active sites and reward those that stay relevant and fresh. You’ll have a blog page on your site, which is an excellent way to add new content, if you have the time (or the resources to pay someone else for your content). You’ll have noticed that many businesses now have blog pages but, sadly, all too many of them have a single post that says something like “Welcome to my blog, it all starts from here” and is dated five years ago. It’s better to have no blog, than a blog like that! If you’re struggling for inspiration for your blog page, then you might find it in your local area. If you’ve provided signage for any charity events, or posters advertising school sports days or youth club fund-raisers, try writing about those. Even if you can’t find the time to write a news item about it, you may be able to use the networking opportunity to help with another aspect of web marketing – link building. From the early days of the internet, search engines have tried to rank websites based on how connected and relevant they are to the wider online community. Back in those days, website owners often responded by creating a page of links and nothing but links, in the hope that the websites they linked to would reciprocate and give then an equally uninspiring mention, with the all-important link. Nobody ever ready links pages, other than website owners, checking to see whether their own generosity had been repaid. Search engines have long since got wise to this and many similar tricks so, whilst links are, if anything, even more important than they ever were, you’ll need to use them wisely. Don’t be tempted to ‘buy’ links – they aren’t worth anything and the search engines will recognize them for what they are and your place in the search engine rankings will suffer as a result. You need to earn links from other members of the internet community. Happy customers, local charities that you sponsor, other businesses that you’ve networked with through local events – all of these are useful, relevant links that will please the search engines, but you need to work them into your site naturally and ask for the same favor in return. A blog post or news item that reports on a local event and references the good work of a particular charity with a link is a natural, relevant connection. A link in a long list of entirely unrelated links is not. One of the most important aspects of modern web marketing is, of course, social media. You will need a Facebook presence and, in any business to business market, you should have a LinkedIn account, since your potential customers and anyone else you need to network with will also have a profile on this, the main social media platform for business. You shouldn’t stop there. You may not think that Instagram is relevant to a business of any kind but it’s designed for sharing images and anyone who works in the world of print should consider using it as a gallery and portfolio. You can showcase the work you’ve done and demonstrate what you can do for your future customers. You should also look into smaller, local networking sites. Any opportunity that you can find for connecting with potential customers should be explored. Of course, no one can deny that all of this takes time. You need to concentrate your energies on running your business and it may not be possible to be your own, full time marketing consultant at the same time. You can outsource aspects of the effort to other people – content writers to produce blog posts, social media gurus to manage your various platform memberships, SEO specialists to handle the behind the web page details…or you could talk to web2ink.com about our marketing services. Web2ink can take your web marketing worries off your hands and optimize your site for you. Our flexible monthly plans can be tailored to your needs on an ongoing basis. Scale up or down or cancel whenever you want. We’ll not only ensure that your website is generally optimized for search engine results, we’ll pay special attention to local optimization. Your website will always appear higher in the search results of local users than the websites of national competitors. We’ll ensure that your site is regularly refreshed with new, relevant and engaging content and we’ll supply monthly reports on traffic and rankings. If you’re in the sign printing business, get in touch with us and find out how we can build you a website that puts you on the online map. Previous: Previous post: Websites for Screen Printers.